.TOTAL is the ideal industrial marking system for installations where flexibility and customization are required to meet the customer's printing requirements. Individual components can be gathered together to make an industrial marking system that can print in any direction, integrate into external systems and give you the ability to print exactly what you need, every time. 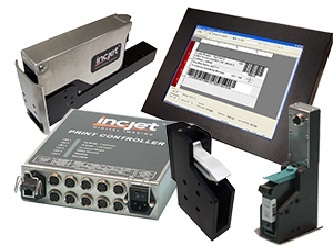 All .TOTAL industrial printing and marking systems are simple to integrate into existing packaging lines and equipment. With industry-standard mounting configurations and a design that takes up less room, it is a smarter alternative to bulky print systems. Whether you are printing small or large characters, fixed images, lot and date codes or even variable data, MJR Vision’s industrial marking systems can do it all. With rugged, flexible hardware, software that puts you in control of how you integrate it into your projects and the widest range of inks for printing on almost anything — from paper to plastics, in black or in color — you have the ultimate industrial marking system.